President Trump broke with the Department of Justice last week by calling for the release of a four-page "FISA memo" purportedly summarizing widespread surveillance absues by the FBI, DOJ and Obama Administration, reports the Washington Post. 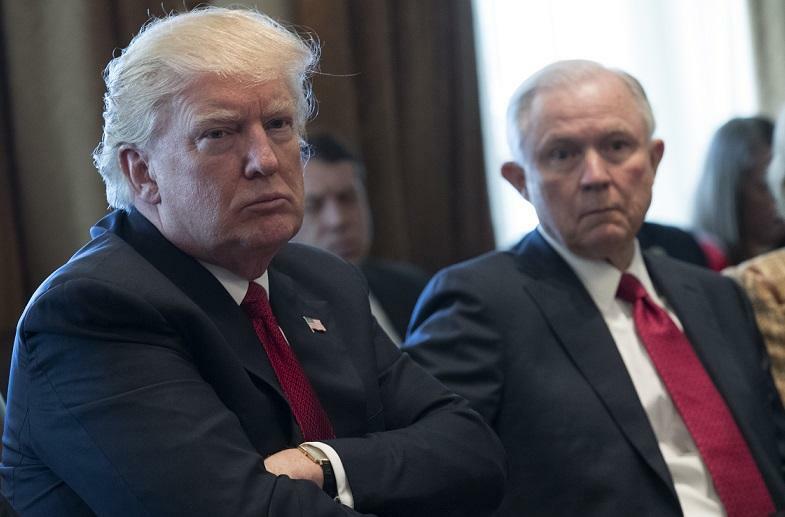 The President's desire was relayed to Attorney General Jeff Sessions by White House Chief-of-Staff John Kelly last Wednesday - putting the Trump White House at odds with the DOJ - which said that releasing the classified memo written by congressional republicans "extraordinarily reckless" without allowing the Department of Justice to first review the memo detailing its own criminal malfeasance during and after the 2016 presidential election. Somehow WaPo knew that Kelly and Sessions spoke twice last Wednesday - once in person during a "small-group afternoon meeting" and again that night over the phone. The memo, written by staffers for House Intelligence Committee chairman Rep. Devin Nunes (R-CA), was made available for all Congressional House members in mid-January for viewing in a secure room. Lawmakers who have seen the document have called for its release to the general public, as it is said to contain "jaw dropping" revelations of extensive abuse of power and highly illegal collusion between the Obama administration, the FBI, the DOJ and the Clinton Campaign against Donald Trump and his team during and after the 2016 presidential election. "I have read the memo," tweeted Rep. Steve King (R-IA), adding "The sickening reality has set in. I no longer hold out hope there is an innocent explanation for the information the public has seen. I have long said it is worse than Watergate. It was #neverTrump & #alwaysHillary. #releasethememo." "It is so alarming the American people have to see this," Ohio Rep. Jim Jordan told Fox News. "It's troubling. It is shocking," North Carolina Rep. Mark Meadows said. "Part of me wishes that I didn't read it because I don't want to believe that those kinds of things could be happening in this country that I call home and love so much." Meanwhile, The Washington Post is spinning Trump's desire to release the memo as yet another example of the President's "year-long attempts to shape and influence an investigation that is fundamentally outside his control," pointing to reports that he wanted to fire special counsel Robert Mueller III last summer (which Trump denies). WaPo also points to Trump's complaints over Deputy Attorney General Rod Rosenstein for not properly supervising the Mueller probe, and the President's alleged comments to former FBI Director James Comey demanding loyalty and asking him to back off the investigation into former National Security advisor Michael Flynn, who was fired for misleading Vice President Mice Pence over his contact with Russians. In other words, Trump has been resisting an active investigation which has yet to prove any collusion, and which has experienced significant mission creep into the personal finances of the Trump team - and The Washington Post is spinning it as Trump once again interfering with an investigation. That said, the Washington Post article appears to be nothing more than an exercise in pearl clutching over Trump's demands for loyalty - as the paper notes that nothing the President has done is likely to lead to criminal charges. "The president has been clear publicly and privately that he wants absolute transparency throughout this process," Gidley said in the statement. "Based on numerous news reports, top officials at the FBI have engaged in conduct that shows show bias against President Trump and bias for Hillary Clinton. The president has said repeatedly for months there is no consideration of terminating the special counsel." So future leaders of the free world take note; you're not allowed express dissatisfaction when a federal agency allegedly colludes with the previous administration and an establishment candidate to rob you of an election using unverified evidence from Russian officials; it is also frowned upon to have a problem with a kangaroo-court witch hunt launched to push the invented narrative.